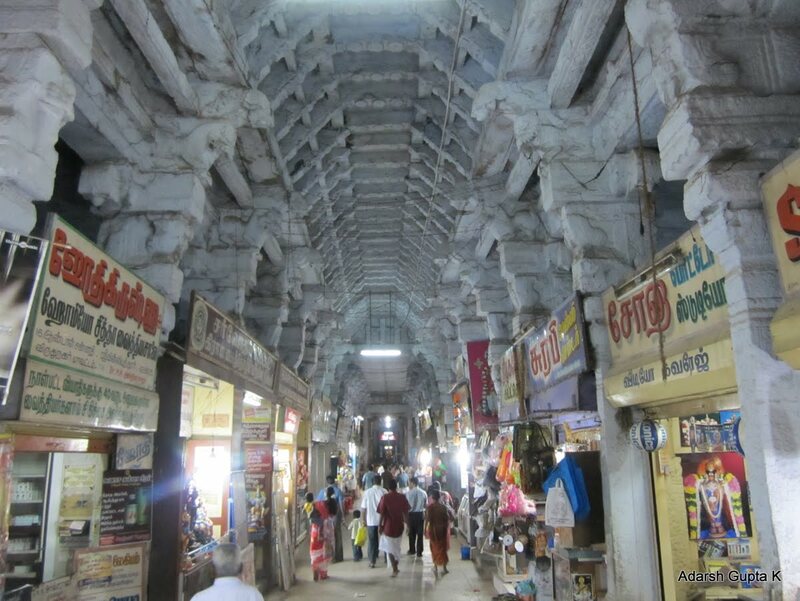 Located 70 Kms South West of Madurai is Srivilliputhur, the birthplace of Andal and considered to be among the holiest of the 108 Divya Desams. This is the birthplace of not one but two Azhvaars and a father-daughter one at that- PeriAzhvaar and Andal. Legend has it that this town was built by two hunters Villi and Puttan and hence the name Villiputhur. The temple dates back to 1st Century AD. 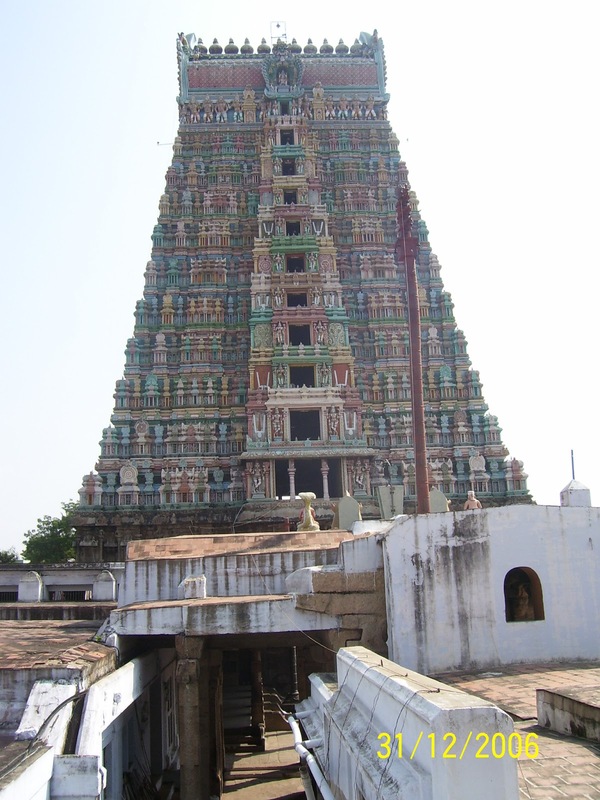 The 196 ft high temple tower is 2nd only to Srirangam’s Rajagopuram (236 ft) among the Divya Desams. The 9 tier temple chariot is said to be the biggest in Tamil Nadu. 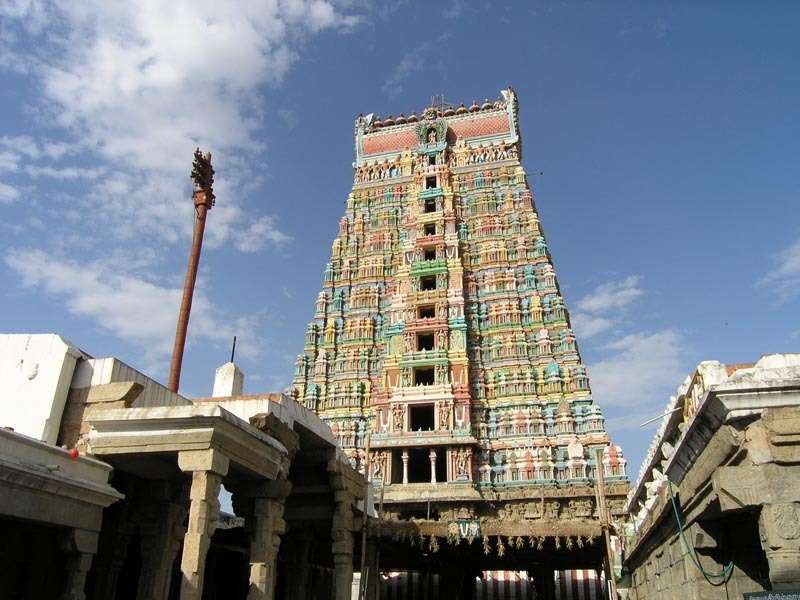 It is the Srivilliputhur temple tower that is enshrined as the Tamil Nadu Government logo. The majestic and magnificent Rajagopuram never gets missed from the eyes of the travelers from a long distance even before reaching the town. The 192 feet high gopuram has found an enviable place suitably representing the ancient architecture, culture and beauty of the Tamilians in the emblem of Government of Tamilnadu. Vatapatra Sayee is further known in other names like Pallikonda paramaswamy, Vata perun koil udayan and Periya Perumal. The temple is situated just adjacent to Andal temple. Connecting them in between is the garden - the birth place of The Tamil poetess Andal and her guardian parent Periyalwar. The sanctum sanctorum is two tiered. 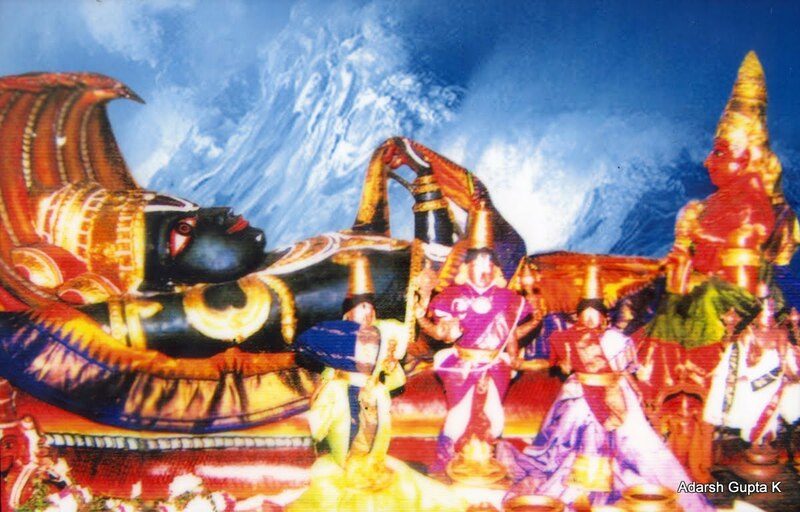 You have to climb steps to have a darshan of Lord Vatapatra sayee who is resting in a recumbent posture under "Vimal krithi vimanam"; All the celestials like Narada Rishi, Markandeya Rishi, Garuda, Surya, Sanathkumaras and the consorts of Lord Sridevi and Boodevi are present along with the resting Moolavar. Another very important and unique aspect of temple is that Moolavar is made of “sudhai” and not stone as in other temples. When we come down, we have the darshan of Lord Lakshminarasimha in the lower tier of sanctum sanctorum. In front is “Gopala Vilasam” a beautiful Mandapam where “Pagal Pathu Adhyayana utsavam” during Margazhi month and ‘Unjal thavam” in Aippasi month are celebrated. Vaikunta Ekadasi is another festival in Margazhi month. On that day only ‘vaikunda Vasal’ is openned. Devotees throng in thousands forming long queues to have the darshan of Lord Rangamannar- Vatapatrasayee through Vaikuntavasal on Vaikunta Ekadasi. 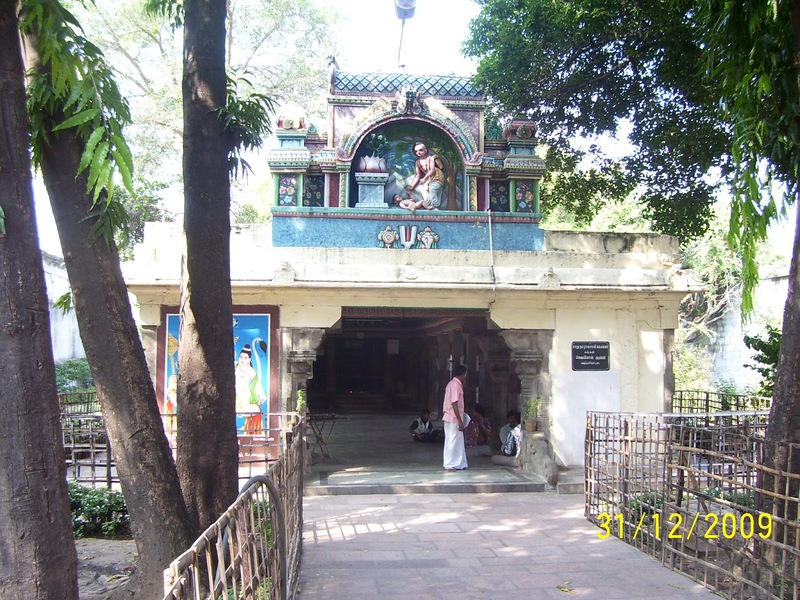 Bhagavan Sriman Narayanan, during his Varaha Avataram, slayed an asuran called Kalinemi and took rest under the foot of a banyan tree, with his consorts Sri Mahalakshmi and Sri Bhooma Devi in a place called Shenbagaranyam (meaning beautiful forest, in Tamil, in sanskrit -CHAMPAKA ARANYAM). Shenbagaranyam was a small part of large kingdom ruled by a queen Malli. Her sons Villi and Puttan were hunters and used to hunt animals in Shenbagaranyam. One day these two hunters went to the forest for hunting and spotted a tiger. They tried to kill it with Puttan vigorously chasing it. Villi lost track of his brother. After some time, the tiger managed to kill Puttan by hiding behind a tree and pouncing on him at an opportune time. Villi came searching for Puttan and, on seeing his dead body, was overcome with grief. After some time he fell asleep. During his sleep he had a dream. Sriman Narayanan and his consort appeared in his dream and said "O, Villi do not grieve. We will get back your brother's life." He mentioned his previous appearance as Vatapatrasayi in Sayana Thirukolam under the foot of the banyan tree and said that there was a cave near a huge banyan tree where his moorthy (statue) had been lying for a long time. There were also lots of gold coins and jewels near the cave. He instructed Villi to use the money to deforest the place and build a village with a temple after installing the statue in the temple. Villi woke up to find his brother Puttan alive and narrated his dream him. He then built a small town and a temple by installing the statue of the Lord and thus the Vatapatrasayi temple was built. After a forest full of snake mounds was converted into a town by Villi it came to be known as Villiputhoor. 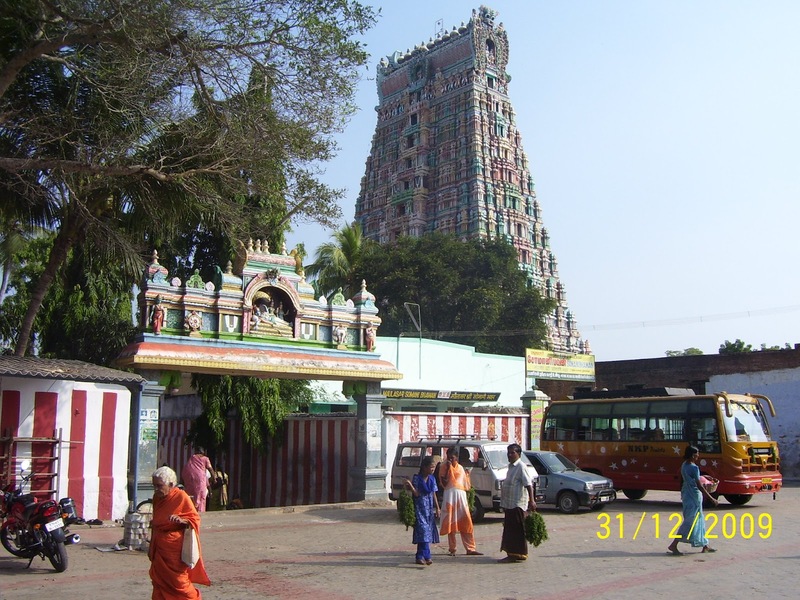 Later with the advent of Sri Andal it got the name Srivilliputtur (the prefix "Sri" being a sobriquet for a holy place). PeriAzhvaar then returned to Srivilliputhur and continued his devotion for Lord Vishnu. One day, while he was performing his daily collection of flowers for the Lord, he found a small girl lying in the garden. PeriAzhvaar named her as Aandal and brought her up as his own daughter. Into her teens, Aandal developed the habit of wearing the garland that PeriAzhvaar had put together for the Lord. With garland around her neck, she began admiring admire her own beauty in the mirror. From a very young age, she began to sing praise of Lord Krishna and began to see the Lord as her husband. This act shocked PeriAzhvaar and he looked up to the Lord for solution. To PeriAzhvaar’s relief, the Lord indicated that he was happy to adorn the garland. 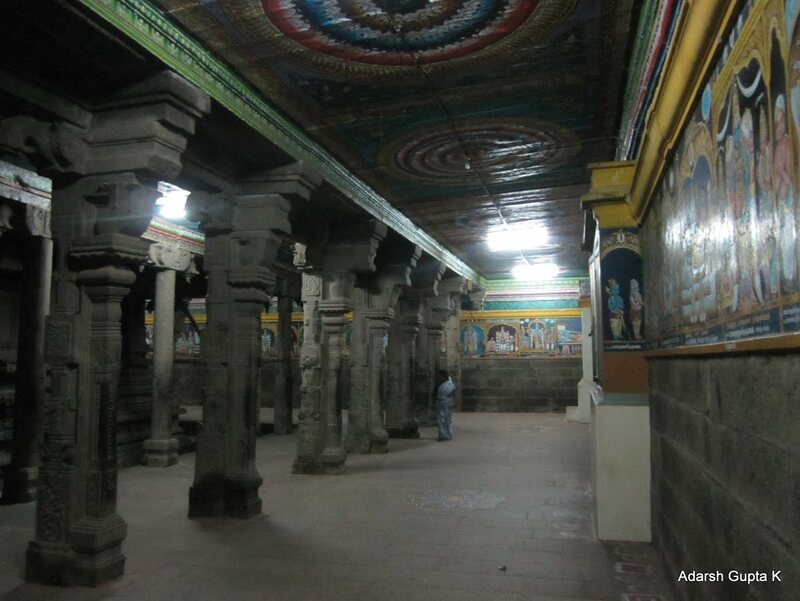 To this day, this unique tradition is followed in this temple, not seen in any other Divya Desam. Lord Vadapatrasaayee adorns every morning the garland worn the previous evening by Aandal (the Goddess). As years passed by, PeriAzhvaar was anxious and worried about the future of Aandal. Answering his prayers, Lord Ranganatha asked PeriAzhvaar to bring Aandal to Srirangam. PeriAzhvaar left for Srirangam in a Palanquin provided by Pandya King Vallabha Devan. On reaching the Cauvery, Aandal suddenly disappeared. PeriAzhvaar continued his trip across the Cauvery. On reaching the temple, he found Aandal alongside Lord Ranganatha. PeriAzhvaar wanted to see this sight in his own place at Srivilliputhur and Lord Ranganatha is said to have made the trip on his Garuda Vahanam and appeared in a wedding posture as Rangamannar. The temple is open from 06:30 a.m. to 12:00 noon and from 04:00 p.m. to 09:00 p.m.
Srivilliputhur is about 75 Kms from Madurai on NH 208. Madurai is well connected with air, rail and road. Many buses ply from all parts of Tamil Nadu to the town of Srivilliputhur. Priest: Mapillai Bhattar @ 94425 47533.